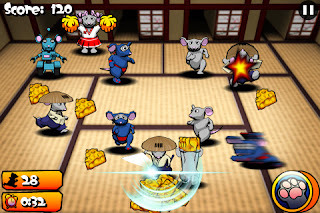 Home Games Mice Heist is the best game for your iPhone! Mice Heist is the best game for your iPhone! Announcing the release of new ﻿reckless game Mice Heist 1.0. for iPhone and iPod touch. Mice Heist 1.0 has been just developed by Trickshot Games and is available worldwide. The gameplay is a battle between the player and a horde of hungry mice trying to steal the users cache of cheese. For one sight the game seems simple but during the action you’ll find difficulties step by step as the mice have a few tricks up their sleeves! You have to prevent your stock of cheese by tapping the rodents as fast as you can and send them running before they get close to the cheese. But the mice are smart, they’ll dodge the taps or zip around in one minute. Besides they’ll be trying to distract your attention by several tricks so watch out! danger for your stock and note that the time is limited. You have to mobilize all your forces to handle these ruthless mice! In case of ﻿exhausting all your forces in this brave battle against the horde of hungry mice you’ll be given an additional move- “Cat Paw”. “Cat Paw” button enables you to summon a cat, that will will scare all the mice away. Mice Heist 1.0 is only $0.99 (USD) and available worldwide exclusively through the App Store in the Games category.